TOTAL FLANKER...a rugby blog: Hallelujah! Much has been made about the "new" scrum laws being applied this season. Aside from the revised engagement sequence - crouch, bind, set - there is, of course, nothing new about the laws that are being applied. It has always been a basic requirement of the laws of the game that the scrum half puts the ball in straight and that no shove is allowed before the ball is put in. The fact that referees are now instructed to apply the laws of the game correctly (hallelujah!) must therefore surely be welcomed. Critics (predictably the coaches of strong-scrummaging teams) claim that the scrum will become de-powered as a result. 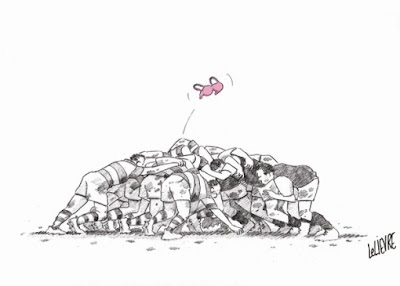 Good scrummaging teams can still be effective - it's just that they'll have to learn to time their drive properly in order to disrupt the opposition ball rather than rely on the early shove on engagement and the inevitable penalty. The result should be more ball emerging from the scrum and fewer penalties which, after the farce of the last few seasons, can only be a good thing. From what I have seen so far, it seems like there are fewer re-sets to the scrums-but maybe I am just being subjective.